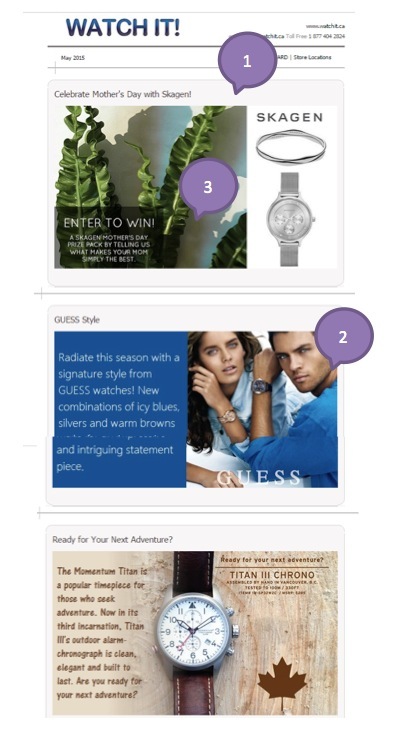 There is nothing new in having retail promotional campaigns aligned with the holidays calendar but launching a promotion in response to an unplanned event is a relatively new concept. We can launch a digital media promotion within hours after we learn about the event. It is not practical to prepare and launch print, direct mail, radio or TV campaigns within few hours, but we can create a simple website banner, launch an online ad campaign and send an email to reach our audience quickly. Agile eCommerce email marketing assumes anticipating and responding to change to provide maximum value to our customers. Using the immediate emotional reaction to a current event will result in increased impulse buying and help your bottom line with minimum effort. Just watch the news as another way to engage your customers. 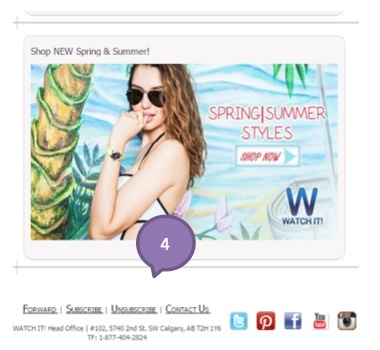 In this eCommerce Email Marketing weekly spotlight, we review examples of email campaigns from Watch It, Costco and SHOEme that centered around the holiday, the current weather trend and the media news. Over 15 years ago, our Founder and CEO, Darren Bondar stumbled across an exquisite watch boutique in the busy streets of New York City. At that moment, he realized that there was a lack of outlets that offered a wide selection and personalized service for functional and fashionable timepieces in Canada. Watches were becoming an increasingly prevalent accessory in the fashion industry and were generally only available at large box retailers or jewellery stores. In November 1999, WATCH IT! launched its flagship store on the famed Whyte Avenue in Edmonton, Alberta. Today, with addition of sunglasses and accessories, WATCH IT! maintains its fundamental mandate of providing Canadians with one of the largest selections of practical timepieces and fashion accessories while supporting them with a high-degree of after-sales service. Mobile Optimized: 2*–The entire email is made from images. They are too big and take a long time to load on the phone. The text and the clickable areas are not mobile friendly. Clear offer:2* – if this is a mother’s day email it should include watches and merchandise relevant to that. 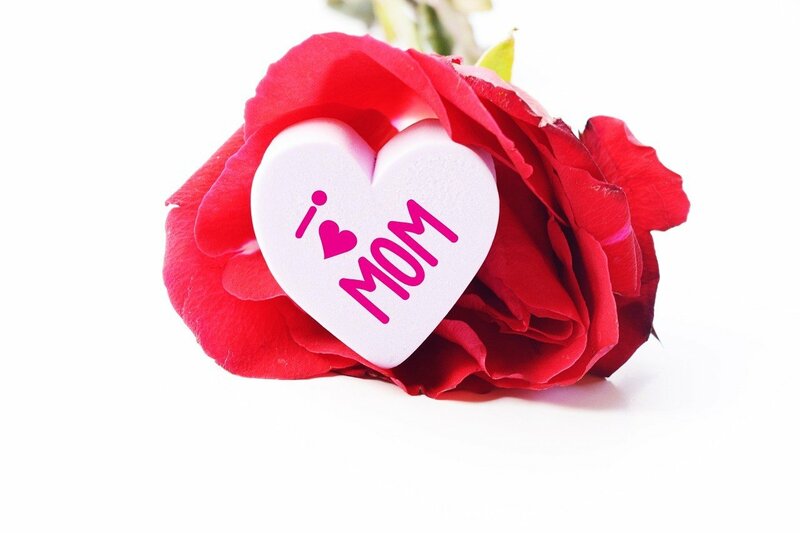 There is only one mention of mother’s day, but even that is not very appealing. The shopper would need to be very familiar with the advertised brand in order to understand the relevancy of the first banner. Product highlights:2* – there are random pictures of products with no clear indication of what they are and how to purchase them. This is email could be used in showcasing emails that are done poorly. This email does not win on design or content. A watch store could have seen a major lift in sales for Mother’s day since it is the second holiday only after Christmas based on retail sales value. Jewelry and watches are the top selling items for this holiday so making a campaign for a watch store just seemed natural. Unfortunately, Watch It lost an easy opportunity to increase sales by butchering their mother’s day email. Costco Wholesale Corporation is an American membership-only warehouse club that provides a wide selection of merchandise. As of 2014, it is the second largest retailer in the United States and the third largest in the world and the largest membership warehouse club chain in the United States. The current Costco is headquartered in Issaquah, Washington, United States and was founded as Price Club on July 12, 1976 in San Diego, California with its first warehouse under the Costco name in Seattle, Washington seven years later. Today, Costco has a total of 671 warehouses, spreading throughout the United Kingdom (26), Australia (7), Canada (88), Mexico (34), Taiwan (10), South Korea (11), Japan (20), Spain (1) and the United States (474). Subject Line: Bonus offer on Hunter Douglas blinds PLUS great gifts for Mom! Mobile Optimized: 3*–This email is not mobile optimized. This email has the same layout as the desktop and does not shift into a single column mobile-friendly view. The information is still visible but hard to read. It is surprising to see that a company this size is not designing emails to be mobile first. Now even Google gets accessed more on mobile devices than desktop. Subject line:3*–the second part of the subject line about Mother’s day will appeal to a wide audience. The mother day promotion should have been central and not being labeled as a “plus”. Product highlights:4* – the various products are clearly identified with full details, price and a link to the product pages. This is a low score for an international retailer. There are 2 main problems with this email, it is not mobile friendly and it has too much information which is not even relevant to the main message of the email campaign. It is important to have one central marketing message or promotion and create all offers around it. Product selection for a specific promotion is very important part of the promotion planning process. Placement and relevance of the product offer in the email are critical to the success of the email. SHOEme is one of Canada’s fastest-growing eCommerce companies. Our mission is to constantly challenge, innovate and deliver new and better ways to shop. We apply technology and fashion expertise to enable consumers to discover leading, boutique and exclusive brands. We provide an unparalleled level of customer service and proudly offer free shipping and a hassle free return policy on every order. Fonts:3* -the white font over the image is very hard to read. The fonts used under the product images are easy to read. Images:3* -the life shot images are too big and take a while to load. These images are more suitable for a website and not an email. Formatting:4* – the life shot images occupy too much premium email real estate. The product areas are nicely formatted with well-defined areas that are easily clickable on the phone. Mobile Optimized:3* – The images take too long to load. Once loaded the layout flows nicely on the phone in a single column. Subject line:3* – to use a specific brand in the subject line must only be done in a very targeted list, otherwise the click through is going to be very low. The urgency to purchase:2*– there is no urgency to make a purchase. There is no start or end date, there is no discount. This is more of “information” email about the brand that could be used to try and reach people who would normally not buy this brand. Product highlights:4* – great product shots with multiple views and products in action is sure a great way to encourage further interest and click through. I have reviewed SHOEme in my last week blog about my great shopping experience with their site. Unfortunately the same cannot be said about their emails. The email campaign needs to be a lot more targeted to be effective. Based on my last purchase from the site; a pair of kids shoes, why would I need a pair of boat shoes? Once again, proper targeting and tailoring the messages to shopper needs is vital in order to receive the desired result from a marketing campaign. Talking about timely and relevant! What a crafty and smart way to incorporate the daily events in your marketing promotions! This email came the next day after the Royal baby Princess birth announcement. With today’s always-connected consumer it is important to create relevant and prompt offers to engage them. Make the consumer feel that you are in tune with them and care about their delights, instead of having the promo be about your overstock items. The same promotion could be implemented in multiple ways. 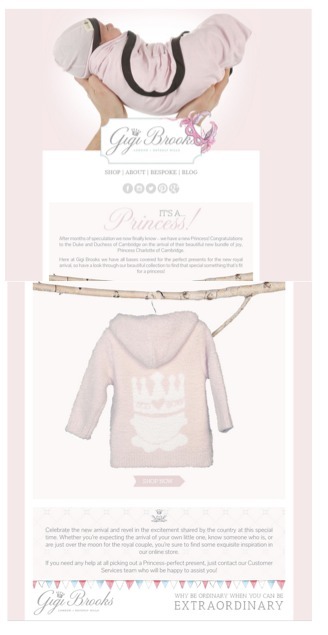 You can send an email about a baby crib promotion that you need to liquidate or you can send an email about the newborn princess and just casually mention your cribs. Which would one appeal to the emotions of new moms? I know the princess one would definitely work on me.